Here comes case study for you. How to choose a correct truck for your operation. Reach Trucks are forklifts used in narrow aisle applications, such as warehouses. They are designed to have two outer legs that help distribute the load, and a single set of wheels in the back. The wheels are located below the operator, which help create a tighter turn radius. This allows operators to navigate smaller spaces, and still be able to reach higher racking. Making your aisles taller and narrower is a good way to create more space when your warehouse becomes cramped, but it can also make navigation and material handling difficult. The GS Reach Truck is an asset to any warehouse fleet – it allows operators to easily navigate in and out of narrow aisles and reach significant heights, all while maintaining lifting capacity. The GS Reach Truck allows for unmatched confidence in the most challenging warehouse environments. There are many reach trucks on the market to choose from, so what makes the GS Reach Truck stand out? The GS Reach Truck gives you the ability to adjust the rate of deceleration, which allows you to lower loads very slowly with minimal impact upon reaching the ground level. Travel and lift/lower speeds have a lot to do with your level of productivity. GS out-performed four competitors in a one-hour cycle test. 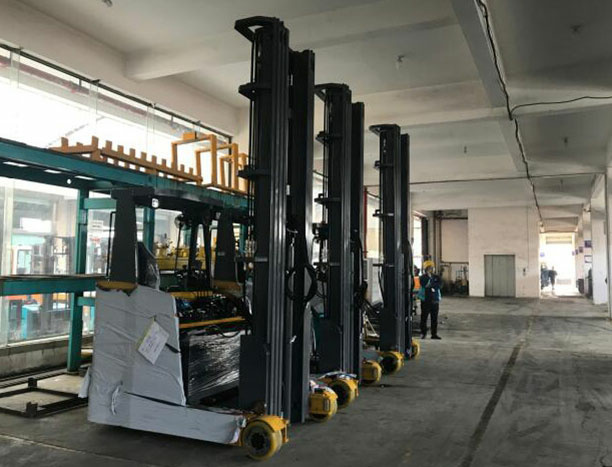 You can take your productivity to new heights with the ability to perform a lift and auxiliary function at the same time while operating your GS Reach Truck. You won’t need a laptop to perform diagnostics or make adjustments to values of perimeters within the Reach Truck’s Vehicle Manager. The GS Reach Truck has a tremendous amount of programmability so you can tune it to your needs.